February 12 is the 43rd day of the year in the Gregorian calendar.There are 322 days remaining until the end of the year(323 in leap years). 1946 – African American United States Army veteran Isaac Woodard is severely beaten by a South Carolina police officer to the point where he loses his vision in both eyes. The incident later galvanizes the civil rights movement and partially inspires Orson Welles' film Touch of Evil . 1994 – Four thieves break into the National Gallery of Norway and steal Edvard Munch's iconic painting The Scream . Sir John Fastolf was a late medieval English landowner and knight who fought in the Hundred Years' War. He has enjoyed a more lasting reputation as the prototype, in some part, of Shakespeare's character Sir John Falstaff. Many historians consider, however, that he deserves to be famous in his own right, not only as a soldier, but as a patron of literature, a writer on strategy and perhaps as an early industrialist. Alison Des Forges was an American historian and human rights activist who specialized in the African Great Lakes region, particularly the 1994 Rwandan genocide. At the time of her death, she was a senior advisor for the African continent at Human Rights Watch. She died in a plane crash on 12 February 2009. Mat Mathews, born Mathieu Hubert Wijnandts Schwarts, was a Dutch jazz accordionist. 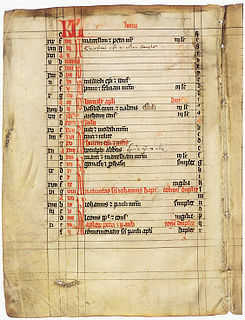 Year 821 (DCCCXXI) was a common year starting on Tuesday of the Julian calendar. Saint Benedict of Aniane, born Witiza and called the Second Benedict, was a Benedictine monk and monastic reformer, who left a large imprint on the religious practice of the Carolingian Empire. His feast day is February 12. Year 890 (DCCCXC) was a common year starting on Thursday of the Julian calendar. Saint Damian was an Egyptian soldier and martyr. Julian the Hospitaller is a Roman Catholic saint. Wikimedia Commons has media related to February 12 . ↑ Sir Edward Shepherd Creasy (1870). History of England from the Earliest to the Present Time: The history during the early and middle ages. J. Walton. p. 434. ↑ J. Edwards (11 June 2014). Ferdinand and Isabella. Routledge. p. 100. ISBN 978-1-317-89345-5. ↑ Hugh Raymond Spilsbury Pocock (1967). The Conquest of Chile. Stein and Day. p. 69. ↑ John Stewart Bowman (October 1986). The World almanac of the American West. World Almanac. p. 44. ISBN 978-0-88687-273-1. ↑ Penny Cyclopaedia of the Society for the Diffusion of Useful Knowledge. C. Knight. 1838. p. 499. ↑ Juan Luis Ossa Santa Cruz (2014). Armies, Politics and Revolution: Chile, 1808-1826. Oxford University Press. p. 142. ISBN 978-1-78138-132-8. ↑ "Announcement of the Government of the Republic of North Macedonia for entry into force of the Final Agreement, Constitutional Amendments and Constitutional Law for Implementation of Amendments". Влада на Република Северна Македонија (in Macedonian). 2019-02-12. Retrieved 2019-02-14. 1 2 George Lillie Craik (1850). Pictorical History of England. W.S. Orr & Company. p. 124. ↑ "Lyndon LaRouche, Cult Figure Who Ran for President 8 Times, Dies at 96"